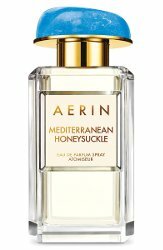 Aerin has launched Mediterranean Honeysuckle, a new fragrance for women. Escape to the sun-drenched, azure Mediterranean with this eau de parfum by AERIN Beauty. Sweet honeysuckle and sparkling grapefruit take you there, evoking lush flowers and shimmering beaches. Italian bergamot, sun-warmed and citrusy, and mandarin oil impart lasting freshness. Lily of the valley and lush gardenia build to the sensuality and richness of jasmine sambac absolute. It is a fragrance as magical and wonderful as its inspiration. Aerin Mediterranean Honeysuckle is available now at Nordstrom, in 50 ($110) or 100 ($155) ml Eau de Parfum. Update: additional notes include ambrox and musk. Wow! Those notes together sound amazing! I would love to try this. The Aerin line has some nice fragrances. Sounds like this will be a nice summer scent. It sounds very summery! I will give it a shot. I’m always on the lookout for a good honeysuckle fragrance, so I’ll try this. Unfortunately the Aerins have tended to be a letdown for me – a little too clean and safe, maybe. Same here — love honeysuckle, this might be too clean for me. I recently got a bar of Honeysuckle soap at TJ Maxx, that smells divine – honey suckle and honey! Wish I could find a perfume that smells like that soap does…. I do like that bottle. Ah, I knew you were going to ask that! I don’t remember. I’ll look tonight when I get home and post it. Commonwealth Soaps and Toiletries. Looks like they make a lot of different things. Didn’t find the honeysuckle soap on their page, tho. Guess I’ll just have to get Aerin’s perfume to go with it! Well darn, I was intrigued – I love honeysuckle – but this one lost me as soon as I saw the other notes. I can’t do grapefruit, and I really don’t care for gardenia or LOTV. Fortunately, I have my all- time favorite honeysuckle, Soivohle’s Honeysuckle Bird, to remind me that I don’t *need* another honeysuckle fragrance in my wardrobe. Got a Clinique Happy vibe almost immediately. And y’all know we all have a jug of that somewhere.